While headlines have been popping up every few weeks about animal welfare issues at the Surabaya Zoo in Indonesia, little is known about the people behind the controversy. According to the New York Times, critics are pointing to for-profit safari park owner Tony Sumampau, who used to run the zoo. One of Mr. Sumampau's longstanding complaints about the zoo is that longtime employees do not work hard. Almost no staff members could be seen inside the zoo during two visits on a recent Sunday, though it was crowded with visitors, some of whom were throwing peanuts and other food to the animals. Ms. Liang also disapproves of euthanasia, citing a moral reluctance to take life. When Chandrika, an elderly white tiger, injured its tongue several months ago and had trouble eating, she did not tranquilize and operate, she said, because she thought the tiger was so old that it would die on the operating table. 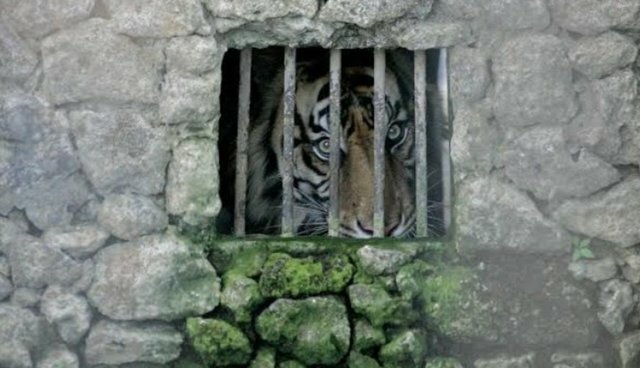 The tiger instead became more and more gaunt, to the horror of animal activists around the world, until its weakened immune system was unable to fight off pneumonia, and it died. You can learn more about the Surabaya Zoo's history of animal abuse here, and sign a petition to close down the zoo here.